We also have many reviews on our Google+ Page. "Hi. Thank you for the recent work that has been completed in our home. We just wanted to thank you for the prompt professional service provided- especially with regard to the two workmen who carried out the work, & most of all John. They were both very professional, clean, tidy, friendly, punctual and worked their socks off. John went above and beyond and stayed late to finish the work - not a problem. He was courteous and extremely hardworking. We would recommend James Foy to anyone and any future work will be placed your way (but we would want John on the job - we are so impressed with him - he is a credit to your company). Thanks again for all the hard work by both workmen and the efficient service provided. Many thanks." "Thanks for the receipt. Pleasure doing business with your company - we were very happy with the (complicated) work done on the house, namely converting three old and inadequate water and heating systems to one modern one. John and the other lads doing the work were a credit to your company. They worked at our conversion long and hard but left everything neat and tidy at the end of each day and the end result is excellent." "Sorry for the delay, just had to thank John and Justin for their work. They never stopped until they installed our central heating system ,they are an asset to any firm. All the workmen who came to the house were polite and proffesional. We would not hesitate recommending this firm to anyone needing work done." "James Foy Plumbing recently replaced a bath/shower valve for me. I found them professional, efficient and quick from start to finish. I would definitely go to them again with any further plumbing problems and wouldn't hesitate to recommend them to others." "Hi having trouble leaving a review. Just wanted to say in this day and age its very unusual to get hassle free service. Gemma advised us that the engineer would be with us at 4.30. Phil arrived promptly on time, he was polite and efficient and replaced our shower. The service was excellent and the price really reasonable. Great service to have a new shower fitted within 24 hours Many thanks. Sharon and Paul Coy"
"Hi, This is just a small note on behalf of my Dad, Mr Bruns. He told that he was very happy with the work carried out by the engineer who came to service his boiler today. He also said he appreciated that your office telephoned him to let him know the time to expect the engineer. Dad, who lives alone, needs to feel he has reliable and knowledgeable people he can call, and especially if he had an emergency plumbing or electrical issue. This was Dads first experience using your company and the word he used, when I called to ask him how the appointment went, was excellent! Thank you. Celia Cox"
"Gemma thanks for sending this through so promptly, really appreciated. Once again I'd like to commend Paul on his excellent professionalism and customer service focus. Gem can you please advise when this work can be scheduled with Peter (Paul's best friend & obv another top bloke as indicated by him :) As I'll be in numerous meetings tomorrow (actually later today since it's gone midnight!) it may be difficult to speak until later on in the day so email may be easier. Gemma I'd also like to ensure that James (the company owner and therefore I'm assuming your boss) knows what a top customer service lady you are. Everything you have advised me on has happened accordingly. Your care, patience and understanding with my situation has been more helpful than you could ever appreciate over a phone line Gemma. I honestly can't thank you enough. James is an incredibly lucky man to have such committed and helpful staff working for him. I look forward to hearing from you later Gemma and I'll give you a bell as soon as I am able. Once again many thanks for being so incredibly efficient. 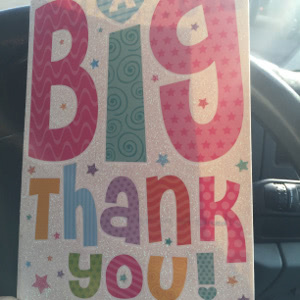 Kind regards, Emma"
Customer recently gave us a card! "Dear sir/madam Just to let you know the plumber that came to repair our shower last Thursday, Paul was absolutely 1st class, very professional talked me through what was wrong, how he was going to repair it and most off all very friendly, After getting in touch with the plumber who fitted the enclosed shower, he kept on putting it off, I will never use him again, James foy was excellent and I will recommend you to work colleagues and friends, once again thank you. I did try and leave a review on your website but I'm pretty thick at stuff like that. Mr Stone"
"We have worked with James Foy Pluming Ltd at our Liverpool sites for a number of years undertaking various small scale reactive plumbing works. Due the fact that the works were always completed first time and on time we invited Foys to tender for the installation of new unvented hot water cylinders at our Atlantic Point site. Phase 1 was completed on time, to budget and with no health or safety incidents." "I would like to thank you for the excellent service you provided yesterday. Darren was extremely professional and explained everything fully to me. My two gas fires need servicing and I will be calling you back towards end of the month to get these done by you. I will also be recommending you to family and friends. Once again many thanks for your service and I will be in touch soon Kind regards Michelle"
"James Foy are a professional and very understanding company, from the initial point of contact. Gemma and Claire are friendly, approachable and understanding. I moved house 12 months ago and since that date I have a lot of work carried out by James Foy and would highly recommend their services to others. Nothing is ever too much trouble and all work is carried out quickly to a high standard. Customer aftercare is outstanding and their patience and understanding is above and beyond any ones expectations. Thank you so much James Foy I appreciate everything that you have done for me. Your engineers have all provided excellent customer service and special thanks to Peter who has the patience of a saint. I appreciate that the above is only a short summary of our relationship this past 15 months, but as you know it would be a best seller if I detailed everything. Your support has been amazing and appreciated. Really don't know what else to say apart from thank you again." "We have been very impressed both by the quality and efficiency of the workmanship - compliments to Darren - and also the courteous and knowledgeable administration behind your organisation. It is a pleasure to have timed appointments that are adhered to and to receive confirmation and update texts. We would have no hesitation in recommending your services.Regards Gerard Donaldson"
"I received Excellent service from the very start. Everything was very clear and explained. I honestly wasn't expecting a complete customer service from a local plumbing company. B.Regards"
"I have been very impressed with James Foy Plumbing from the efficiency and politeness of the people booking the appointment to the excellent plumber Paul. It was a small job - sourcing and changing a bathroom basin tap and resealing a shower tray but nothing was too much trouble and there was no charge for the initial assessment. I liked the way they send a text the day before they are due to arrive to confirm that they are coming .They are a real find and I wouldn't hesitate to recommend to family or friends. They will certainly be the first port of call for any work that I need to be done in future. A 5star company, many thanks"
"Drain Clearing Services provided by James Foy plumbing are second to none!! The Engineer who arrived at my house "Dean" was a very knowledgable, experienced and pleasant bloke! After some investigation he had resolved the issue of the blockage and also cleaned and disinfected the whole area which had been effected! I am delighted with the service provided by James Foy and would suggest their services to family & friends. Thanks again"
" Thanks so much for providing should a fast and efficient service. Will definitely recommend you to family and friends, With best wishes Rachael"
"James Foy Plumbing is the first company that springs to mind when quality of service is required. The whole process from start to finish runs like clockwork. They are totally competent and efficient, but above all else...honest. I have no hesitation in recommending James Foy to all...particularly members of the NAS/UWT." "Hello......I would like to thank you very much for the excellent service provided. Pete came yesterday once again and completed the outstanding job. What a credit to your company he is, a proffesional , friendly and competent gent. I am delighted with the service received and have recommended your company to all my friends and colleagues.Kerrie"
"First of all, Thank you for agreeing to install my dishwasher and completing the job today. Peter the engineer did a fantastic job, and was very helpful. You have all been very sincere and very helpful with advice too since I first made email contact so thanks again. Plus, I'd be only too happy to tell my friends and colleagues of your services as I think it's been first class. Just to say that I have read your kind attachment and I will make full payment tomorrow by telephone with my debit card. I hope this is agreeable for you. Again I'd like to say many thanks for a great job, and thanks for initial advice on the installation, I appreciate it greatly. Have a good evening and I will telephone tomorrow. Many Thanks & Kind Regards,"
"Excellent service from start to finish thank you so much!" "Good Afternoon I would like to thank your company for prompt economical and efficient repairs to my mother in laws boiler ,it would malfunction just as the weather goes cooler !. Your fitter Allen was an excellent tradesman, honest and very friendly and put mum in law at ease as she feared massive bills. Service ..... Excellent and the staff too. 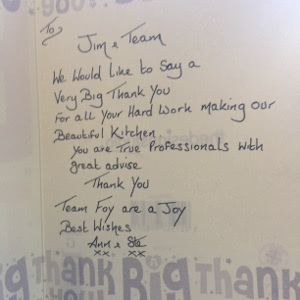 You will gladly be recommended by us to others Many Thanks"
"Peter from James Foy Plumbing came to my home to repair the drain outside my kitchen. He carried out the work to a very high standard, and was very friendly and professional, thank you Peter! This is the third time James Foy have carried out work at my home, each time excellent with very good prices, I would not hesitate to recommend this company to anybody." "Fantastic company and service. Had issues with our Boiler, James Foy sent out someone to diagnose the problem (free of charge), provided a quote (very competitive) and then scheduled for a Plumber to come out and undertake the work. Allan was fantastic, very knowledgeable and fixed the problem with no issue, whilst also providing some advice in regards to our water pressure. Payment was arrange via an invoice, overall extremely happy with the service, staff and quality of the repair. Thanks to everyone at James Foy Plumbing!!" "We have used your service twice for our rental property in June. We got problems right before the tenants moved it. John came to the property to replace the leaking pipe and the cost was reasonable. He solved our problem quickly and he knew what he was doing. Then Allen came to repair the boiler and it took him hours to fix it. He worked efficiently and explained in detail to us and the tenants. Both engineers were helpful and informative. A reliable friendly service, I would not hesitate to recommend this company to anybody." "Receipt received, thank you. We would also like to thank you for your prompt and efficient service. You are an excellent company to deal with and we will certainly use your services again and would not hesitate to recommend you to family and friends. Many thanks for a job well done." Just like to thank you for the excellent service we received from your company re fitting a new shower. John arrived on time and advised us which type of shower was suitable and then collected and fitted it in the same evening. We would have no hesitation in using your company again or in recommending you to friends. "Just a bit of feedback about engineer who attended today,his name is Alan he done a proper job also great customer service and a delight and credit to you." "Thanks for a great service. Alan was methodical, knowledgeable and clean. We will use and recommend you again. "To all the staff at James Foy Plumbing especially Michael who did an excellent job replacing the bath and shower nothing was to much trouble.Delighted with the outcome,would not hesitate to recommend your firm.Excellent customer service. Kind regards"
"I called James Foy to arrange a boiler service, gas safety certificate and minor repair work at my rental property. Within a week they arranged a time that was convenient with the tennant and completed all work for a competetive price. The communication was great throughout by email and phone as well as the engineer calling me from the property to discuss the options for the repair. All aspects have been completely hassle free and I will definately use them again next year." "Dear Sir, I wish to convey my thanks for a professional and efficient installation carried out in full compliance with your detailed quotation. Yours sincerely"
"James Foy plumbing provided a friendly and efficient service throughout and our boiler is now working to its full potential again. Great value too." "I wouldn't hestitate to recommend you guys at all. Brilliant job well done by Michael fitting my shower on Saturday and I will be in touch once I have found a new bathroom suite and have Michael back to fit it for me. Thanks a million"
"When I asked my letting agent for a plumber that they would recommend they gave me the number for James Foy Plumbing. It was only a simple job to replace shower for my tenant that I didn't have time to do. There were a couple of issues but they made sure it was right. I would definitely use them again." "We used James Foy Plumbing to replace an old shower unit. The Engineer who visted was very punctual and was able to source us a new shower immediately. The Engineer removed the old fixture and fitted the new unit quickly, tested it in front of me, and tidied up afterwards. I would certainly not hesitate to give James Foy Plumbing a call again in the future"
"Neil from James Foy came to my home to cut and cap off a redundant underfloor radiator pipe, and to carry out a repair to my WC cistern. He turned up promptly and carried out both jobs to a high standard. This is the second time i've used James Foy in the past month, and have been very pleased with the quality of work and prices charged on both occasions. I recommend this company!" "Once again we were amazed by the quality of service provided by James Foy and in particular the way Liam was happy to stay on the line for 45 minutes and help our daughter with a developing situation in relation to a leak within her block of flats. His calm and reassuring manner was exactly what was required in the situation. We would have no hesitation in recommending James Foy. Once again thank you Regards Colin Avery." "Alan from James Foy came to my house to fit a new gas hob and carry out a gas safety inspection. He turned up promptly and fitted the hob quickly and efficiently. A fast, friendly and efficient service. I would definitely recommend this company!" "Our deepest gratitude for the efficient service and professionalism provided to us. Not only did the Senior Engineers offer quality service but the assistance provided by the whole team was faultless. The team went out of their way in resolving our boiler problem that qualified engineers from other plumbing company (after numerous visits) still could not diagnose. Truly professionals and fully recommended. Thanks again!" "This is the second time I have used JFP and I find the staff very polite and knowledgeable. I had called due to my shower tap leaking and the engineer was tidy and efficient in fixing the problem." "As usual, excellent service end to end, from the office team to plumber on site. Fours issues fixed with boiler in one visit. Thanks again, John"
"Just a quick message to thank you for the gas safety check service provided the other day. Allan Saville was very informative, thorough and friendly - beyond anything I expected for a routine check-up. Very impressed. Thanks very much." "I contacted James Foy Plumbing regarding the urgent need for a new central heating boiler. The person I spoke with was polite, respectful and efficient. He gave me a date for the job and kept to that date. The work was carried out, as promised, within the space of one day and the site was left clean and tidy. The cost of the work was very reasonable, and I would definitely use this firm again in the future, for any aspect of plumbing work needed in our building." "Can I say to the Chiefs at James Foy that John was absolutely fantastic. I have come across a number of plumbing professionals over the years and John is by far the most outstanding. He was on time, didn't leave till the job was done and wouldn't even stop for 5 minutes for a coffee even though I asked him many times. He was very thorough with my ageing CH system and the house feels like a tropical jungle instead of the Arctic wasteland that it did last week. John cleaned up after himself -- which was great since I'm a little unstable on my leg and find it hard to get down to floor level -- and was very patient with my little dog Nipper who wouldn't leave him alone. Wonderful service, thanks very much." "Just a note to say thanks for providing a fast, friendly and reliable service . I'll definitely use your services again if the need arises." "Thank you very much and I would like to say that I found the workman very nice and very helpful. I would certainly want to use your services again when needed." "Thank you for the receipt. I am pleased to say that I am delighted with the work and the two gentlemen who carried it out. Firstly they were efficient and competent and as a very nice extra (these days) they were pleasant and considerate. I will have no reservations in recommending your company to any friends and family and should the need arise I will definitely use your company again. Sincerely"
"Many thanks, I was delighted with the service I received from your company! Prompt, efficient and really good communication about how things were progressing. I wouldn't hesitate to recommend you to anyone. Kind regards,"
"Excellent service from start to finish. Gemma was very helpful in arranging my appointment and the engineer was tidy and efficient (replacement of bathroom sink & taps). Thank you, Jeremy"
"I found the process of organising a new boiler very straight forward with James Foy Plumbing. The engineer (John) was very helpful in discussing requirements and arrived on time. It was very helpful to be able to receive the quotation in PDF format for 3 boilers following my discussion with the engineer, and I was pleased that it was the same engineer who fitted the boiler. The communication from Gemma in the office was excellent in arranging the quotation and a day suitable to me for fitting. John did a great job fitting the boiler, and was a real friendly guy. I will recommend James Foy plumbing to anyone requiring heating work." "I found James Foy Plumbing to be a very professional company, kept to the appointment time and fixed the problem in a quick and cost effective way." "Thanks for the rapid service and quality of the work carried out by Paul, and thanks to Paul for his hard work and time spent fixing the fault on my boiler and hopefully it will be fine for the warranty period of 12 months on the repairs he has made. I will definitely recommend your company to friends and family should they need work carried out." "I felt I had to write to express my satisfaction at the work carried out by John. A courteous, honest and efficient example of how things should be done...properly! Your Organisation has restored my faith after being badly let down by others...I genuinely thank you for that, and will most certainly be using James Foy again...next Monday in fact! Thank you." "I just wanted to say thank you for the recent work you did for me. I was a bit stressed as my bath was leaking into the kitchen and I was due to go away, but everyone I spoke to in the company was really helpful and Jimmy the plumber, who fixed the leak, was lovely and really quick and efficient. I'd definitely recommend James Foy Plumbing to friends." "Many thanks for your speedy and well priced response to blocked basin in the property"
"I recently had a new boiler fitted by James Foy Plumbing - they are a pleasure to deal with. From the moment I made contact until after my new boiler was fitted (and beyond!) the service was swift and courteous. Our central engineer, John, fitted the boiler in a day, staying late to tidy up after the installation. I cannot fault James Foy Plumbing." "Thanks for coming out today. Great job, and a nice friendly service from Dave and Co. Many thanks." "Many thanks to Dave this morning the leaking shower was fixed and we can start using it again. I will definitely be using the company in the future." "Very pleased with the service and the work carried out for us. Dave and his colleague were friendly and professional, and it was clear from the outset I was dealing with people who cared about giving us a good job at a reasonable price. Would recommend to anyone." "Thank you, first class service as usual. Same day repair, can't ask for better than that!" "Will recommend you to family and friends, very pleased with the job that was done. Regards Neil." "Hi. Can i thank your team and the staff member that came to do my gas check today. The gentleman actually got my gas fire working the first time in years as every other gas check person hasnt bothered. Nothing was a chore. Very Much appreciated"
"I cannot recommend James Foy highly enough! After buying out new house, we were informed that we would need to replace the old boiler, which was very inconveniently situated in a bedroom. British Gas had quoted us almost £4000 to replace the boiler and relocate it into the kitchen! Fortunately for us, we discovered James Foy and are so glad that we did! From the very beginning, we were extremely impressed with the customer service provided by the lovely Gemma - she was so helpful and nothing was too much trouble. We were booked in for a quotation with John and after a thorough and very professional check of the property, we were given a quote which put the previous one to shame! John commenced the work and did a fantastic job - including relocating some hideous pipe work which was left on display by a previous owner. He was very professional and such a nice guy - he could have just left us with the instruction booklet for the boiler, but he took the time to stay and explain the entire thing to us. Overall, the service provided by James Foy and their employees is flawless and I'd recommend them to anybody who needs a 5 star professional service!" "Thank you and your team of workmen for a job well done. I would have no problem in using your company for any future work. Many thanks"
"Thank you for the service. And I would recommend your company to anyone. Thanks again." "I would highly recommend James Foy plumbing. They carry out thorough gas safety checks, provide excellent customer service via friendly and helpful staff and are very prompt with providing the safety certificate for landlords. I will definitely be using their reliable service again." "Just had a new boiler fitted. An excellent job completed in the exact timeframe given. Excellent service from the customer service department thank you Gemma to the efficient work of Neil who fitted the boiler. Many thanks." "Hi. Thanks for the invoice. We will definitely use you again and I'm just sorry we didn't discover you sooner. Very professional and efficient and a positive experience from start to finish, including the service on the phone. I will also recommend you to family and friends and will put a recommendation on my firm's internal electronic "notice board". Now that we've sorted out our heating coming on when we don't want it to I'll be in touch shortly about getting to a point where we can go in the garage at night without a torch! "Gemma and the team delivered a superb service from start to finish without any complications. Would highly recommend the service to other landlords." "Just a quick email to thank you so much for the recent work you carried out on our home. We were so impressed as you came out to quote us within 2 days, and gave a very competitive price. The work was then carried out promptly. Our plumber was very professional and hard working, and the job was carried out to a high standard. I would definitely recommend you to friends and family, and would always use your service again. Thanks again,"
"I have used James Foy Plumbing twice now, and both times have been very happy with the work done and the service provided. It was always made clear to me how much I would be charged and I was kept up to speed on the progress of the job. I would be happy to use them again and also to recommend them to others." "Many Thanks. We were in a terrible state when my 92 year old father needed a plumber in Liverpool, from the start you were extremely kind and courteous, your workmanship was first class, punctual, honest and your fee was very favourable. Thank you so much, therefore I have great pleasure in recommending you." "I will certainly be recommending yourselves to everyone! On time, clean, tidy and professional. Job well done." "Thank you very much for your prompt and efficient service." "What an excellent service. Thank you. I would be very happy to recommend you." "Just to say a big thank you to all the staff at JFP. VERY FRIENDLY SERVICE everything explained and fixed my shower. One very happy customer will defo be calling on you again. :-)"
"Thank you for much for arranging the servicing and testing so promptly. Despite having to work in difficult conditions the two engineers were friendly, efficient and courteous. We shall certainly use your firm again." "I was finding Quite difficult to find a well priced & trustworthy plumbing company and now i believe I can now stop looking. Neil, is polite, knowledgeable and competent. He works cleanly and neatly and listens to the customer. I would happily recommend James Foy Plumbing to My Family and Friends & I will use Again in the future, thanks Guys." "This is the first time I have used JFP and would definitely use them again. What I thought would be a big repair was a very simple job. The staff were very helpful and knowledgable." "I am a solicitor in South Liverpool. In addition to giving legal advice, clients chat with me about many aspects of their lives. Amusingly, frequent topics are boilers and plumbers... the cost of boilers, the unreliability of plumbers and so on. I have been fortunate so far in never having to call out a plumber for a repair. My luck ran out as when I returned home recently, the 'heat flux'? (whatever that is? Neil did explain it to me perfectly) had broken and the boiler flooded my kitchen. I googled 'emergency plumber' and James Foy came up near the top. Telephone service and advice was fantastic - second to none. The plumber who arrived was named Neil. He was clearly extremely knowledgeable and very friendly, giving non-rushed time to the inspection. Neil knew what the problem was immediately and could repair it. I didn't even question the price as I trusted Neil immediately (rare for a lawyer to do!). The repairs were carried out quickly and faultlessly. It was only later (post payment) I made some casual enquiries to see what price I could have had the repairs done for by someone else (not that it mattered as the service was well worth the price). James Foy were the cheapest by over 10%. I couldn't be more impressed." "We were recently looking for a plumber to do a job for us and found James Foy on Google. We called them to get a quote and were really pleased with the price they gave us and how quickly they could come out and so booked them in to do the job. The plumber who attended our surgery was polite, clean, completed the job quickly and cleared up afterwards. We were delighted with the job they did and would definitely use this firm again and highly recommend them to anyone"
"It is a real pleasure to deal with true professions. From start to finish the whole experience from first contact to final invoice has been completely hassle free. Not only has the work been exceptional but the price was incredibly reasonable too. I would not hesitate to recommend James Foy Plumbing to anyone. Best Regards!" "Just to say how pleased I am with the work carried out on my boiler, From start to finish the service that I received was friendly and reassuring and everything explained in detail. Thank you Gemma & Michael." "Thank you for your high standard of work. I would not hesitate recommending you to family, friends in Liverpool and neighbours at City Quay." "I had a good reliable plumber who retired. Since then, over a number of years, I found it impossible to find another plumber whose work I could rely on and who charged a reasonable price. I have now used James Foy twice and I believe I can now stop looking. Neil, is polite, knowledgeable and competent. He works cleanly and neatly and listens to the customer. What more can I say?" "James Foy Plumbing answered my call straight away, arranged a service appointment for the next morning and Michael turned up ahead of time, was very pleasant and efficient. I'm very impressed and will be choosing their services again!" "James Foy was reccomended to me and I can say I am glad they were, a complete new bathroom was installed from a shell to the finished article no mess no dramas just quality workmanship will be using them again." "This is the third time I have used James Foy Plumbing. The first job was a leaking boiler, the second was to renew a kitchen tap and the third time was to resite a bedroom radiator. I have found this company totally reliable. The plumber who came out to do all three jobs is very pleasant, helpful and reliable. The prices charged were very reasonable and I would recommend anyone to use this company. I will certainly recommend this company to all my friends." "Superb service, all fixed quickly & efficiently. I will definitely call you next time." "Could not be happier with the service I received. On time, clean, quick and great value for money. A brilliant job, 1st Class." "Thank you very much for your swift service. I have never used or heard of you before I found you on google but the service I recieved from contacting you to getting the job done was great. I will be using you again if need to and I have recommended you to my head office so we can use you for our company." "I just wanted you know that I now have my new boiler installed without a hitch by Michael and just wanted to thank you all for the brilliant service and courtesy calls. If I ever need a plumber I now know where to go, I will be definitely be recommending you to my colleagues and family members. Hope you all have a Merry Christmas and a Happy New Year - I know I will now I have heating and hot water!! Thanks again I am very grateful"
"A Friendly and professional service, I would definitely use them again"
"Great service and I would gladly recommend you to others..."
"Your guy diagnosed the fault in no time and fixed it the day after. No fuss, no mess - very professional and effective. At a reasonable price too. Great support from the staff at the office. I would certainly recommend James Foy to others." "Communication from this company is exceptional. Gemma is professional yet friendly in her emails and responds very promptly. As I was booking a service for my elderly Mother I was keen to be kept in the loop, and Gemma kept me fully informed without me ever needing to ask or chase. The engineer was friendly, competent and patient, completing the job quickly and efficiently." "Thank you to James Foy Plumbing for their quick response and for sorting out our blocked drain. Very friendly, efficient service and competitively priced too. Thank you very much for your help." "Fast efficient service.. very competitive price and would recommend James Foy services to anyone. Thank you." "It was Monday night when the hot water pipe in the kitchen decided to start leaking badly. I called up James Foy Plumbing and I honestly couldn't be happier with their services. They guided me step-by-step on how to stop the water leak, so as to prevent further damage to my flat. Then first thing next morning I had someone come round to fix the leak, only took him 20 minutes and left no mess behind. Quick,efficient and very affordable. Couldn't recommend them enough 5/5." "When our electric power shower decided it was no longer be fit for purpose, I needed to get it replaced in double quick time, but was certainly NOT looking forward to the 'hassle factor' that come with most repairs/replacement items of such nature now a days. My personal policy is to shop local for trades people, rather than look for the 'cheapest' as I believe in using local skills as much as possible. I found James Foy Plumbing via Google and as they were within a short distance I rang them on a SATURDAY MORNING and received a fantastic fast NO HASSLE response. The engineer was at my home within a very short space of time, and, not only quickly identified the fault, but located a replacement, at a very reasonable price, as was the fitting cost. The actual fitting was carried out on time, with the very minimum of disturbance and with no hassle factor of fuss or mess. The engineer was one of the politest and well mannered guys you could ever wish to have in your home, he not only fitted the shower quickly, but also,cleaned up as well, a great service and ambassador for an excellent local company. I would totally recommend this company, wherever you reside." Mike Culleton, Merseyside Toastmaster & Master of Ceremonies. "James Foy Plumbing and Heating are extremely professional and will go the extra mile to ensure we are happy with their work. We would highly recommend them to anybody." "I use James Foy Plumbing to carry out general maintenance and emergency plumbing repairs to our properties in Liverpool. I always find them to be reliable, efficient and competitively priced. I would have no hesitation in recommending James Foy Plumbing to a friend or other housing provider." "Having been made well aware of rouge traders by the media, I was very anxious to book in a plumber without making a thorough research. However, I needed a plumber urgently to fix what later turned out to be someone elses botch job. 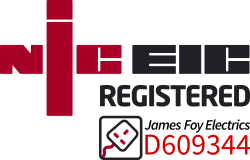 I cannot emphasise enough the work ethics of the James Foy Plumbing staff: quick to act, efficient, extremely diligent, very supportive and eager to explain the simplest terms of the technical details of the job carried out as well as polite and friendly. Will I use James Foy Plumbing again? For me it's not even a question!" "Really happy with a fast, friendly and professional service from the first phone call until the job was complete. Will not hesitate to use again and can't recommend strongly enough." "Just to say, thanks for your assistance at short notice. You liaised with the tenant, kept me informed, and all done on a weekend. Will certainly use you again! Thanks!" "Massive thank you, great friendly service, quick to resolve any issues, fantastic work & a fair price why would you use anyone else!" "Great service, no messing about. Fast, efficient, friendly and excellently priced. Highly recommended." "A really great service - Very polite, efficient and professional. I am happy to recommend them. The peace of mind they gave in detailing what is required and how much it will cost, is exactly what I was looking for - the very competitive invoice was an added bonus." "The plumber arrived within 24 hours, diagnosed problem and fixed in less than an hour. Good service, reasonably priced." You can leave us a review on Google+, Yelp or Freeindex.